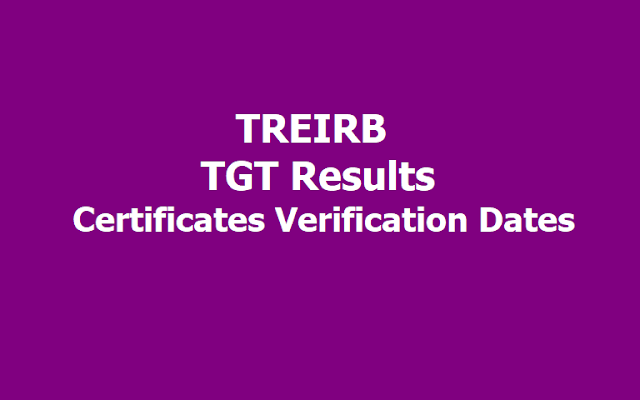 TREIRB TGT Results, Certificates verification dates for 1:2 list of Candidates 2019: Telangana Residential Educational Institutions Recruitment Board, TREIRB issued the TGT Teacher posts recruitment notification in July 2018 and invited online applications from July 9 to August 10 for recruitment at 960 for TGT) of Trained Graduate Teachers in Residential Educational Institutions Societies (TREIS, TSWREIS, TTWREIS, MJP TBCWREIS and TMREIS Residential Institutions). The TGT posts Recruitment exams was held in October month. Telangana Residential Recruitment Board announced the results of TGT Exam on November 20, 2018. టీజీటీ పోస్టులకు సంబంధించి, రంగారెడ్డి జిల్లా నార్సింగి సాంఘిక సంక్షేమ గురుకుల పాఠశాలలో ధ్రువపత్రాల పరిశీలన ఉంటుంది. ఫిబ్ర‌వ‌రి 18 నుంచి ఈ కార్యక్రమం నిర్వహిస్తామని గురుకుల నియామక బోర్డు ఛైర్మన్‌ ఆర్‌.ఎస్‌.ప్రవీణ్‌కుమార్‌ తెలిపారు. పరిశీలనకు ఎంపికైన అభ్యర్థుల జాబితాను వెబ్‌సైట్లో పొందుపరిచామని, ఎస్‌ఎంఎస్‌లు పంపించామని పేర్కొన్నారు. a. All the columns should be filled in by the Candidate containing bio data and other particulars, are true to the best of your Knowledge. b. The certificates such as, Educational qualification, Community certificate, Date of birth (SSC), Study/ residence in support of your claim for local candidature are genuine. d. You are liable for permanent debarment from appearing for the recruitment to be conducted by TREIRB and other PSCs and also criminal prosecution, if Your are found involved in any unfair means / malpractice. e. You further declare that the information furnished by you is correct and my candidature shall be cancelled at any stage if it is found incorrect. Basic Information Date Check list to be filled by the candidate..
08. BC Candidates should Submit Non Creamy Layer certificate as per G.O.Ms.No:8 of 2014 & MemoNo.3009 /BCW/OP/2011, Dt:18-12-2015. Residence certificate for 7 yrs. Prior to SSC if private Study. 13. Erstwhile District and erstwhile Zone you belong to. TREIRB has notified that on the basis of written Examination held during September and October 2018 for the Posts of TGT in various Residential Educational Institutions Societies the candidates whose Hall Ticket Numbers are provisionally picked up in the ratio of 1:2 for Certificate Verification. The Certificate Verification is scheduled to be held from 18 to 26/02/2019 onwards at Telangana Social Welfare Residential School/College (G), Narsingi, Ranga Reddy District, Hyderabad from 9.30 AM onwards. The candidates who are called for Verification of Certificates have to produce the following certificates in original along with two sets of Photostat copies duly attested by Gazetted Officer at the time of Verification of Certificates, failing which, they will NOT be admitted in subsequent process of selection. No request will be entertained for subsequent submission of any of the required certificates. In terms of the Notification, the candidate should possess the requisite qualifications as on the date of the Notification. The Board reserves the right to disqualify any candidate, if he/she is not found eligible for any reason at any stage. Admission to Verification of Certificates does not confer ipso facto any right for Final selection. 1. Check list (1 Set). 2. Hall Tickets of PGT. 3. Date of Birth Certificate (SSC Memo). 4. Un-Employee declaration for claiming fee exemption for the applicants who are in the age group of 18-44 years. 5. Provisional or Convocation Certificate and Marks Memo (Graduation, PostGraduation & B.Ed). 6. School Study certificate from 4th to 10th class or Certificate of Residence/Nativity (When the candidates have not studied in School but studied privately or in open school). 8. Non-Creamy Layer certificate for BC Community Candidates with father name as per Memo No. 3009/BCW/OP/2011, Govt. of Telangana, BC Welfare (OP) Department, Dt: 18/12/2015. 9. Disability Certificate (SADAREM Certificate) in case of PH candidates. The PH candidates have to undergo a medical examination at respective Medical Boards. 10. Agency Area Certificate (ST Candidates hailing from Agency Area only) to those applicable. 11. NOC from employer for in-service candidates. 12. Service certificate issued by the State Government of Telangana for the candidates who are working under T.S. Govt., who are claiming Age relaxation. 13. Proof of Ex-servicemen, if any. 14. 2 sets of Attestation forms duly signed by Gazetted Officer. Government of Telangana Telangana Residential Educational Institutions Recruitment Board (TREI-RB) - Provisional dates for Original Certificate Verification of applicants in the Ratio of 1:2 for TGT Posts under Notification No.01/2018. Note: Hall Ticket No.s would be displayed for candidates called for certificate verification week prior to the date of verification.